This tall, wooden overlap storage shed has an impressive, solid looking design. It offers both affordability, as well as a sturdy, high quality place to store your gardening equipment and tools. Its pent roof gives it a unique appearance and it provides good protection against rainwater. The included sand felt also helps to protect the roof against rot, even in heavy downpours. 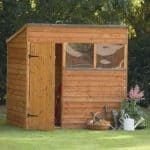 Whilst it is more of an entry-level shed, Waltons have included a few great features ensuring excellent value for money. The styrene glazed window is a good example. Completely shatterproof, styrene is a type of plastic that is a lot safer than glass. The window not only gives the building a nicer style, but it also provides a small level of natural lighting, enabling you to find whatever you need without a torch. A modest sized single braced door supplies good access to the building and it has been fitted with a butterfly catch. This basically ensures the door stays closed when you need it to. However, it doesn’t actually lock the door so you will need to invest in a lock if security is an important factor for you. On the whole this shed may be one of Walton’s value models, but it still provides incredible quality and a reliable, long lasting design. Solid sheet floor may need to be upgraded to accommodate larger, heavier equipment. However, the cost of upgrading the floor is very affordable. This is a tall, pent overlap storage shed, created to hold your everyday gardening essentials. 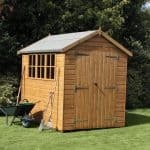 Part of Walton’s value range, this unique shed can accommodate medium weight storage. You can also upgrade the floor so it is capable of withstanding the weight of heavier equipment and items such as mowers and large, heavy boxes. 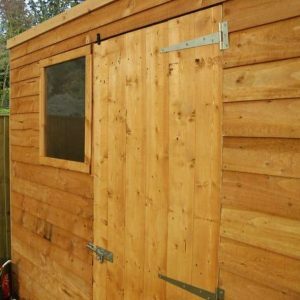 As it is one of the smaller sheds on the market, it does limit its usage to simple storage only. So if you’re looking for workshop space, you would be better off looking at larger buildings with a stronger floor. The one thing you’ll mainly notice about this shed is its height. The unique thing about pent sheds is they are often taller at the front than they are at the back. This is a pretty clever design as it enables you to place the shed in front of other buildings, as well as underneath low hanging objects such as trees. It gives them a space saving quality whilst still providing a great amount of internal storage. The width of the door is slightly shorter than most buildings. On average most tend to measure 0.75m. So there’s quite a difference here, though you also need to remember that this is a smaller sized shed. So it still takes up a lot of building and offers a good amount of space to get in and out. A pent roof not only adds a more contemporary look, but it also offers good protection against rainfall. It has a very gentle sloping feature, causing water to run down and off the building, rather than allowing it to collect on the roof. It also gives the building a flatter design, giving you more flexibility with where you can assemble it. The main difference between this and an apex style building is that you won’t receive the same level of central internal height. 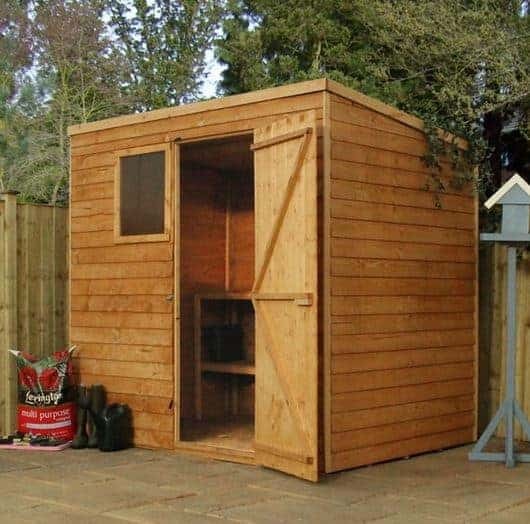 However, as you’ll see from this shed, it benefits from a tall build so you still receive plenty of space to store your taller tools. Created with 8mm solid sheet materials, it could be a little sturdier but you can add roof joists to strengthen it for peace of mind. The floor is also made with solid sheet materials, only it measures a slightly thicker 10mm. It’s not surprising to us Walton’s have included solid sheet materials as this tends to be the norm for overlap clad sheds. They have a lighter, thinner design than tongue and groove or Shiplap sheds and more importantly, they are cheaper. That’s largely why this building comes at a low cost. There are ways to improve the strength of the floor however, such as the extra strength support pack which you can find out more about in the customisation options part of the review. 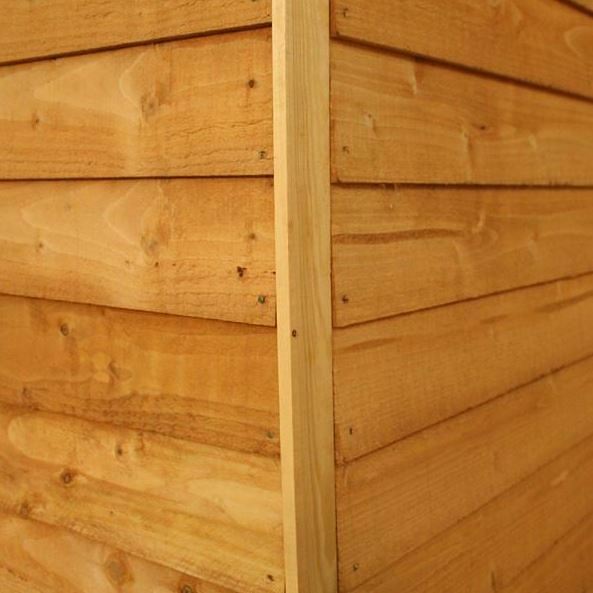 Popular overlap cladding has been used to create this shed, measuring a standard 8mm thick. 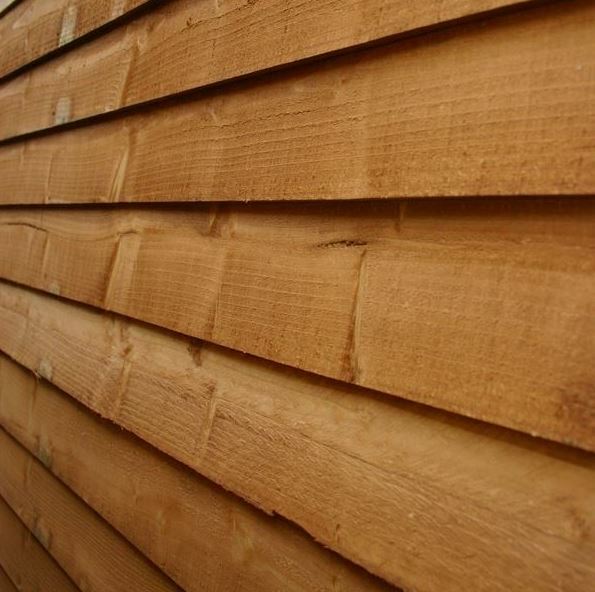 Timber is sawn and then overlapped in the construction of this building, which you’ll often see on garden fences. In most ways, overlap performs extremely well against the weather. However, it is slightly more prone to warp. So if you’re thinking of erecting the shed in a sunny part of the garden, you may want to think again. It has no protection against warping unlike tongue and groove cladding so this is definitely something you need to think about. 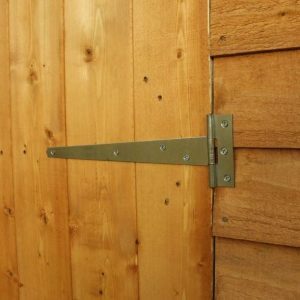 Another factor you need to think of when buying overlap clad sheds is that they do not support the weight of internal hooks and shelves. So if you are hoping to add these to the building, you’d be better off looking at a tongue and groove or Shiplap shed. We should point out that although you cannot install shelving on the walls, Walton’s do have some exceptionally good shelving kits which stand on the shed’s floor. Typical 28mm x 28mm framing is used on the building, providing plenty of support for the 8mm clad panels. Overlap cladding requires yearly treatments so maintenance is something you need to keep up with if you want the shed to last. With some of their buildings, the manufacturer supplies a free treatment, but disappointingly this one doesn’t. Of course the reason behind this is its incredibly low price. Treatments aren’t overly expensive anyway, though the cost will vary depending upon which type you buy. Your options are spirit or water based treatments. Out of the two, we recommend the spirit treatments because of their exceptional water resistance. Penetrating within the wood, an internal barrier is formed, alongside an external one. So basically you receive two layers of protection, rather than one. Now on thicker cladding we’d say you could get away with treating the shed every 2 years with a spirit treatment, rather than 1. However, as overlap isn’t as weather resistant, we do advise you stick to yearly treatments even if using a spirit based one. The good news is if you do take the time and spend a little extra on the annual treatments, you’ll benefit from the peace of mind that comes with the 10 year anti-rot warranty. The shed benefits from a tall, single braced door. The bracing makes it sturdier, ensuring it won’t sag or become damaged even with daily use. It’s taller than average design also makes it easy to get equipment such as tall spades, rakes and even fishing poles inside the building. Whilst it doesn’t have a lock, it does benefit from a butterfly catch which will ensure the doors remain tightly closed in harsh winds. There is also a small, framed window. Benefitting from 2.5mm styrene glazing, this little window is shatterproof and a great plastic alternative to glass. It lets in a small amount of natural light and also gives the shed a more welcoming, attractive look. We would have liked to have seen a lock fitted onto the door to increase the shed’s security. However, as it is designed with budget in mind, Walton’s can be forgiven for not including one. 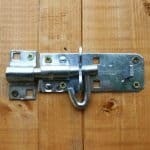 You’ll also find shed locks aren’t expensive so the additional cost shouldn’t pose a problem even if you are on a budget. The window also poses a problem with privacy. Whilst it is located higher up on the building, there’s still a chance people can see what is stored inside. So we’d recommend covering anything of value. With thicker clad sheds we’d suggest adding a blind or curtain, but the overlap cladding won’t support this. Various customisation options are available to those who want to get the most from this great value building. Starting with the roof, you have the choice to upgrade to a more superior duty felt. Unlike the felt included with the shed, this superior edition is built from small glass fibres. They offer a fantastic amount of protection against downpours and will also protect the shed more against falling debris. Unlike mineral felt, fibreglass won’t perish so you’re left with a much longer lasting layer of protection. 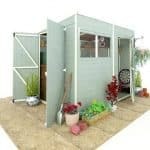 You can also choose from olive green and charcoal to give the shed a slightly more unique appearance too. The extra strength floor support might be worth buying if you want more peace of mind when storing slightly heavier equipment. 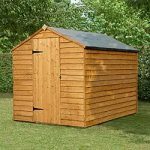 With this size shed we don’t feel it really needs the upgrade unless you’re storing heavy boxes or a particularly heavy lawnmower for example. However, as it comes at a fairly low cost, it could be worth adding the extra support as it will add to the building’s overall stability. Each kit comes with thick floor joists which measure 2350mm long. You will likely need to trim them before installation so that’s something you need to consider. They are really simple to add to the shed however, slotting in between the existing joists. Another way to customise the building is with the wide selection of treatments on offer. We’re surprised Walton’s don’t supply spirit treatments as these are the ones they tend to recommend to their customers. However, the water treatments they do supply are superior quality and often resin enriched. Some colours you can choose from include Dark brown, Cedar Red and Seagrass. The extra that stands out the most for us is the shelving sets. As already mentioned, the overlap cladding comes with the disadvantage that interior shelving cannot be installed on the walls. These great sets from Waltons don’t attach to the walls; instead they stand on the floor of the building. Each one is built from 16mm tongue and groove timber. This means they are capable of holding pretty heavy tools. With two tier and three tier sets available, there’s the potential to add a significant amount of additional storage space. They are also available in 3ft, 4ft and 5ft lengths. The base of the shed is often overlooked in terms of its importance. Did you know that to ensure the shed is fully stable and durable it will need to be built on top of a solid base? Walton’s have two different bases available. The first is the 7×5 Portabase. It really lifts the building up, preventing any damage from the damp ground. It is also constructed with high quality, solid materials and helps to make erecting the building much quicker and easier. The second base available, and the one we recommend, is the 8×6 Pro Shed Base. Now obviously this is slightly larger than the actual shed itself, but on the plus side it gives you plenty of space to build it. This is a more superior base and has the additional benefit of being environmentally friendly. Created from recycled plastic, it also offers ventilation and is very quick and easy to install. The last extra we’d recommend is the hardy weatherproof padlock. Complete with a great hasp and staple, this padlock is one of the most superior on the market. 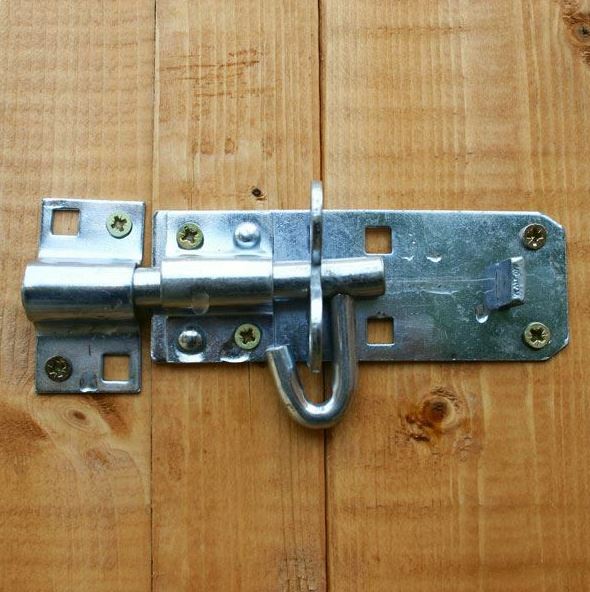 Boasting features such as a protected hardened steel chrome plated shackle, a Thermoplastic weatherproof jacket and double locking, it truly is a remarkable little lock that will help to fully secure the shed. 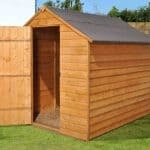 This is a very good quality shed with a range of great benefits. Overlap cladding may be the cheapest, but it still offers a good amount of reliability. 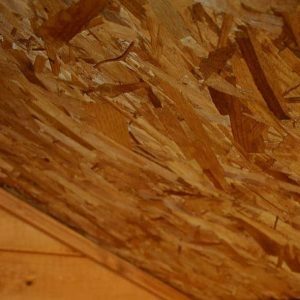 With a 10 year anti-rot warranty, you have peace of mind that the shed is designed to last at least a decade. However, this is only if you treat it as instructed. 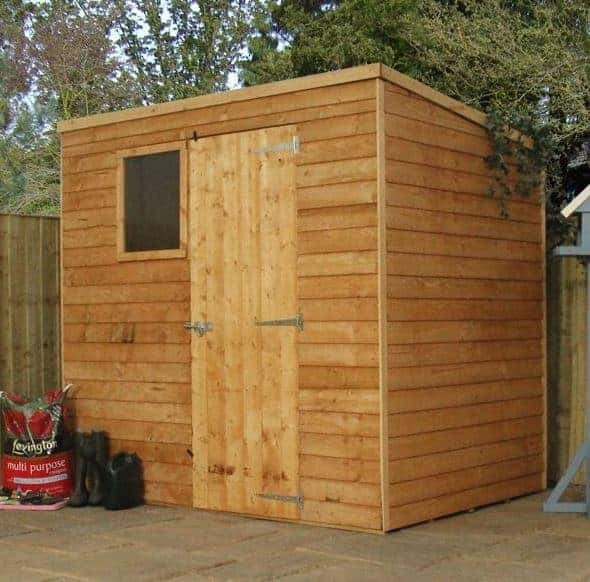 The shed offers a small amount of storage space which can accommodate all of your gardening essentials. The fact it has a tall design makes it suitable for holding taller equipment. You can also invest in standalone shelving kits to increase the amount of storage potential if you need to. All of the fixtures you need to assemble the shed are included and the instructions are easy to follow. You should find it pretty easy to install and with 2 people, it should take no more than a few hours to erect. You do receive pretty good value for money with this building. Firstly you have the extremely low initial cost, then there’s the great features included which add to its value. As we do think you need to spend a little upgrading the shed, this lowers the rating slightly. You also need to regularly treat the building so those costs need to be taken into account too. Final Thoughts: We like the solid construction of this affordable shed. The square design and pent roof make it stand out from the more common apex style buildings. Overlap cladding can sometimes appear a little rough around the edges, but this one has a nice, clean design. There are a few great features included too such as the butterfly catch, styrene glazed window and the braced single door. We also like the fact Waltons provide a 10 year anti-rot guarantee, giving you great reassurance that it is built to last. 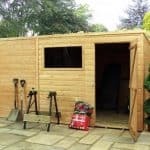 All in all, a fantastic shed which we high recommend to those on a budget.